I have wanted to blog about so many things in the last few months—and ended up discarding the ideas before they were even halfway developed. It happens that way sometimes. Like thinking, oh well, this isn’t important enough to share. It isn’t “blog-worthy.” But anything can be blog-worthy! All that matters is at least a smidgeon of passion from the blogger – and the reader will pick up on it. Meanwhile, let’s talk about apples and oranges. These are small watercolors from my (9×12) sketchbook. But there is a richness here. A feeling of plentitude. A sense of yes, there is enough. 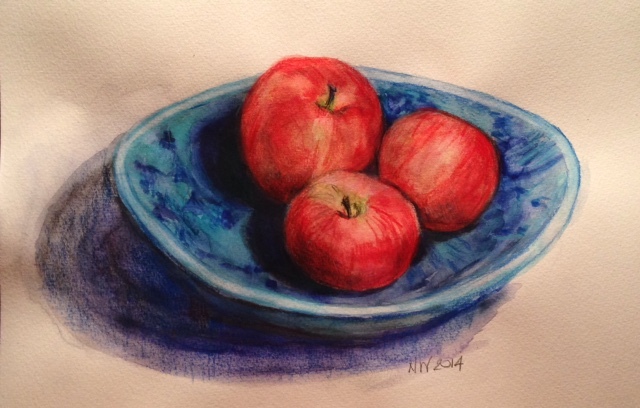 The apples fill up the bowl. The oranges are stacked up on the plate. It was soothing to draw and paint round things. I did the apples first. What happened was I bought too many. This time of year you can buy them in large quantities relatively cheaply, and you won’t miss a few if you set them out in a bowl to paint. The bowl has been set out for years, though only for decoration. It is a bowl I inherited from my mother. I remember it from earliest childhood. It was always on the coffee table. She used it as an ashtray. 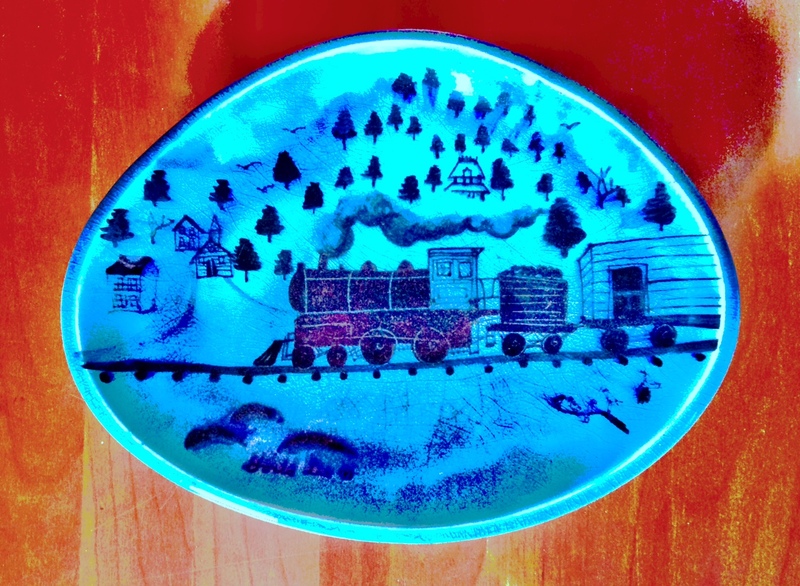 Underneath the apples is a hand-painted picture of a train chugging through the countryside. The bowl represents the past. The apples are the present. The current harvest. The ripeness of now. The apples are sweet. The memory is sweet. The oranges are something else again. They belonged to someone else. (And yet I made them mine, didn’t I…) In the end I had to work from a photo as the owner of the oranges started to eat them. But it didn’t matter, as by then I had them down. She had tricked me. And I loved it. 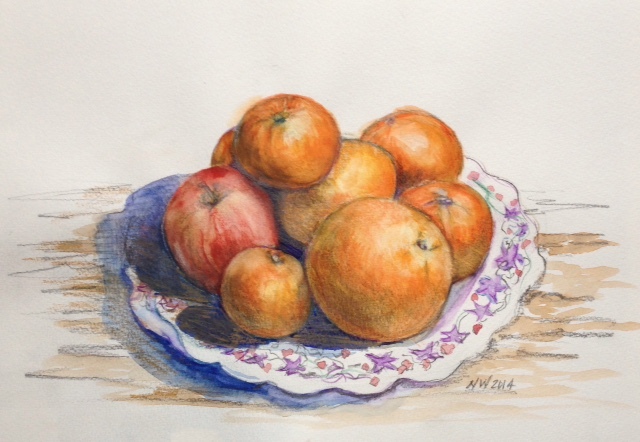 This entry was posted in ART and tagged apples and oranges, art and feeling, blog-worthy, paintings of fruit, passion. Bookmark the permalink.